Kobo has today announced its next addition, the Kobo Glo HD, an ereader set to do battle with the current king of the market, Amazon's Kindle Voyage. The Kobo Glo HD comes with a 6-inch Carta eink HD display with a 1448 x 1072 pixel resolution equaling 300ppi. 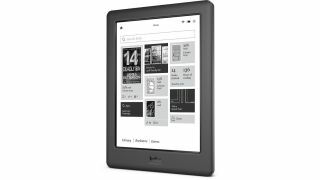 Under the hood is a 1GHz processor, Wi-Fi 802.11 b/g/n connectivity and 4GB of storage fit to fill with thousands of ebooks. As for the battery, all we know is that it will last "up to 2 months" but that's with only 30 minutes of use per day with Wi-Fi and the ComfortLight feature turned off, but no matter what it's bound to be quite strong. It'll only be available in black and weighs in at 180g with dimensions of 157 x 115 x 9.2 mm. Kobo's Glo HD will be available online and in stores from May 1 in the US and Australia for $129.99 and 179.99 AUS respectively while here in the UK we'll have to wait until June 1 for a price of £109.99. Considering Amazon's Kindle Voyage offers a similar spec display it still costs quite a bit more at £169 in the UK – Kobo's offering is sure to sway some customers away from currently the best ereader on the market. We are hoping to get our grubby mitts on one of these in the coming weeks so expect a review soon. Check out review of the Kobo Aura H2O.